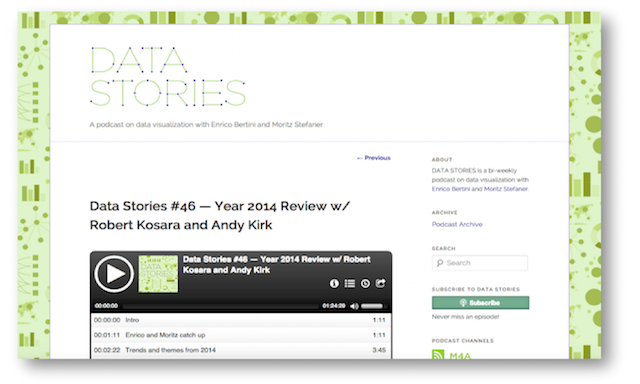 It goes without saying how much of a privilege it is to be invited to contribute to a Data Stories podcast and last week I joined hosts Enrico and Moritz alongside my podcast nemesis esteemed comrade Robert Kosara to review the major trends and developments during 2014 and preview the main hopes and expectations for 2015. As ever, my sincere thanks to Enrico and Moritz for asking me back for a sixth appearance. Data Stories is a hugely important part of the data visualisation field (just look at the archive of brilliant interviews and topics) and, as ever, during 2015 the guys want to hear more from you out there. Send through any questions you want answering or any topics/issues you would like to hear being discussed. You can get in touch via Twitter, Facebook or Email: mail@datastori.es.